Installing hardscape presents plenty of opportunities, particularly for those who have homes that are at the upper end of the market. Many luxury homes, such as those you’ll see located around Fairfax County, VA, Prince William County, VA, Chantilly, VA and in other locations, can be greatly improved by the simple addition of hardscape features. These features can be made out of materials that blend well with historic homes or can be made out of materials that are decidedly modern, the choice is up to you. Here are some of the considerations, however. 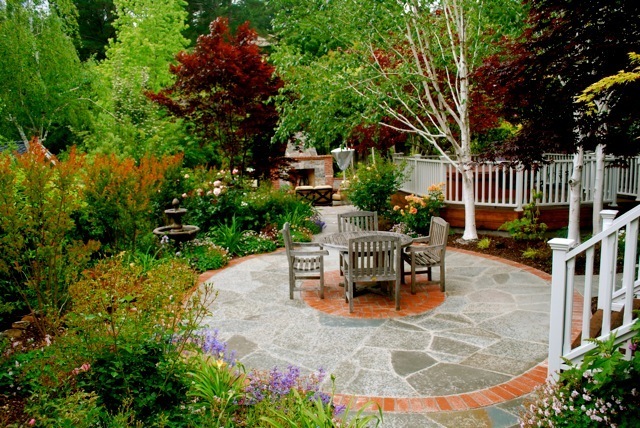 Concrete may not sound as glamorous as flagstone or other hardscape features, but it can be beautiful. Stamped concrete is one of the most attractive hardscape features imaginable. In addition to this, concrete is famously durable and is easy to work with. This means that there is less work to be done on the hardscape when it is installed and that actually installing it is a rather rapid process to complete for skilled contractors. Even though it might not be the first thing that comes to mind, don’t underrate concrete as a hardscape choice. It can hold up to the weather in the District of Columbia area and can provide an attractive and practical surface for many years. If you have a home with a very historic look to it, a brick patio is hard to beat. You’ll find these patios installed on some of the most attractive homes in Arlington, VA, DC and in other locations. Brick patios have a timeless quality to them and they are actually surprisingly easy to maintain. Brick is exceptionally durable, offers an interesting texture – and there are plenty of different types of brick to work with – and can really work well when you want to make your home look as historic as possible. It’s hard to beat flagstone for elegance. Flagstone has so many variations available among the different types on the market that it’s possible to create a very colorful and interesting geometric presentation on your walkway. Flagstone is also extremely durable. Properly installed and maintained, it can last for an extremely long time. This is a hardscape option that offers longevity, aesthetic appeal and that blends very well with upscale homes. In fact, this is one of the more popular types of hardscape found among estate properties and other very high-end real estate. There are many other options to choose for hardscape. Sometimes, homeowners make a decision only on the level of being practical and end up getting the simplest, most cost effective hardscape they can for their home. In other cases, homeowners really want to go for aesthetics and, in such cases, brick, flagstone and other options can help them to customize the look and feel of their property. Either way, hardscape presents a great many different options and plenty of interesting ways for homeowners to make their real estate more interesting, more elegant and more appealing than it already is.